As we have already covered, this season’s Champions League campaign is different for Manchester United in terms of kits as they don’t have white shorts and socks as their first choice. Instead, the black shorts and black/red socks as seen domestically are given supremacy, though they did have the ‘old’ look away to Young Boys Berne. Away to Valencia in Wednesday night’s final group game, the Red Devils will wear a third combination, switching to white/grey socks as the hosts have white shorts and black socks this season to mark their centenary. According to the always excellent United Kits, this is a look first used by the club in the infamous 5-1 defeat at Manchester City in September 1989. 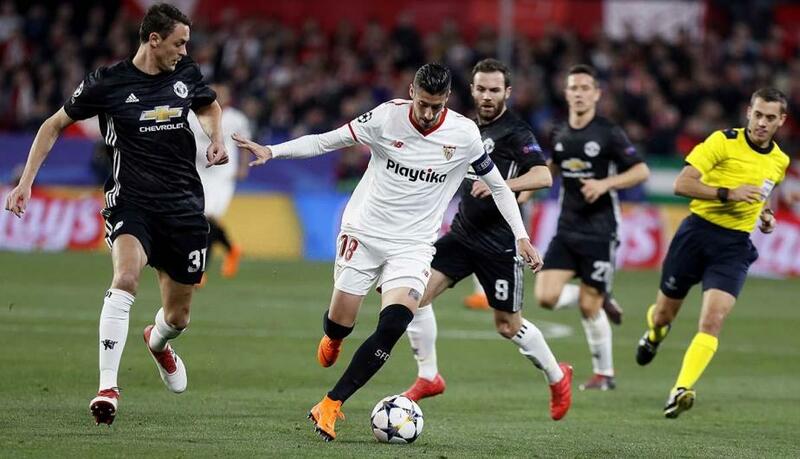 Incidentally, in the last 16 of the Champions League in 2017-18, United played Sevilla – who, like Valencia, had white-white-black – but they opted to wear their away shirts with change socks. That means that the game at the Mestalla will be the first time since 2010-11 that United have worn a kit with three different coloured elements in Europe. Coincidentally, Valencia – then in their usual white-black-white were one of the opponents along with Chelsea as United wore the domestically-favoured red-white-black. Red-black-white was used against Rangers that season. Speaking of City, they host Hoffenheim on Wednesday. Presumably, the German club’s blue home and white away kits are considered by Uefa to clash with City, so they will be in a dark red third strip. However, in addition, the socks from that kit are considered too close to City’s – back in 2000, Arsenal changed from navy to yellow at half-time against Sparta Prague’s maroon due to the confusion – and so Hoffenheim will wear orange socks. The knock-on effect of that is their goalkeeper, who will be wearing an orange shirt and shorts, has to wear the white away socks instead (according to the Uefa graphic, the outfield orange socks are not the same as the GK socks). Surely it would have been easiest for the white socks to be used with the red kit? Not sure why Hoffenheim’s keeper has to wear different socks to his team mates when it wouldn’t make any difference in decisions such as who kicked the ball out. After all years ago in some leagues the goalkeeper would wear the same colour socks (and shorts) as his outfield team mates.